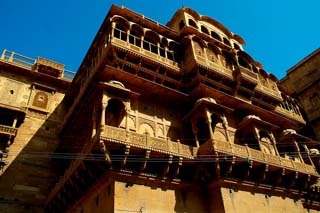 The most important tourist attraction is the Jaisalmer fort. Using yellow sandstone this fort was constructed by Bhati king Jaisal (AD 1155-1183). Because of the yellow color this fort is known as Sonar Qila or golden fort. There is a stone wall of 5 KM in circle and 2 to 3 meter in thickness. The construction was started in 12th July 1155 and it took seven years to complete. Subsequently many new additions done by subsequent kings. This fort has witnessed many battles with Khilji, Tughalaqs, Mughals and other Rathore kings. This fort is located at the town center and can easily be reached. If possible one can even walk 3 to 4 Km distance from railway station to reach the fort. Autos and MUVs are available at railway station and there is no meter system for autos. For a group of tourists it may cost Rs 10 per head for a drop at fort gate. MUVs charges Rs 50 per head for five point sightseeing trip including the fort for a group of tourists. This majestic fort is visible from all the locations of the town and this fort houses many families and you will have a different feeling while visiting this place. Inside the fort you will find kids going to school, vegetable venders, and milkman's selling milk on bikes and many crafts showrooms selling traditional handicrafts products. This is like any other daily life of a small Indian town. 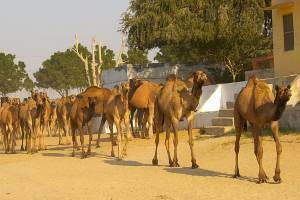 No other forts of Rajasthan have so much regular life within it. In early days the forts were constructed as a protection against outside invaders so all the families along with the king were staying inside the fort. With the population growth and falling of kingdoms people stated staying outside the forts so the city near the forts started developing. Most of the products sold within the fort have the unique color attached to it. 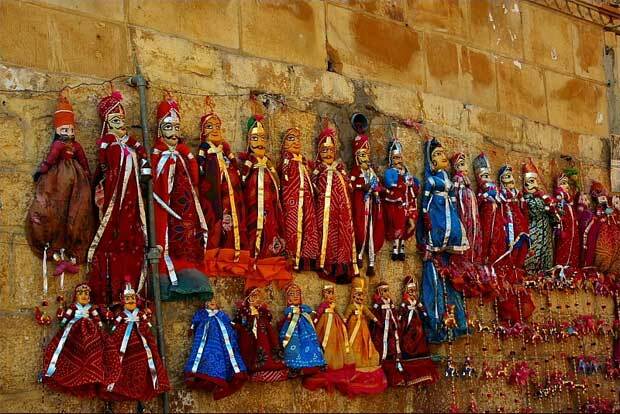 At the entrance colorful puppets hanged on the fort wall attracts many tourists. Tourist caps, toys of leather products are sold at different shops inside the fort. Guides are available but rates are not fixed here. There is an upward slope to approach the center of the fort where the main museum is located. 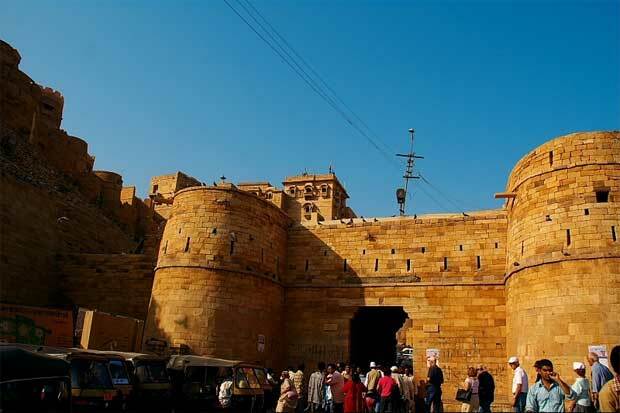 This center of the fort is known as Dussehra Chowk, here the seven storied Raj-mahal now known as Jaisalmer Fort Palace Museum & Heritage Centre is located. 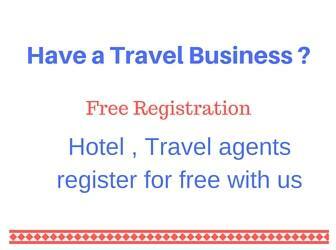 The entry fee is Rs 30 for Indians and still camera is Rs 50. For foreigners the fee is Rs 250 with audio guide and including one still camera. The fee for Video camera is Rs 100. From outside the palace from Dussehar Chowk side the carving and art work of the balconies and windows looks very attractive. 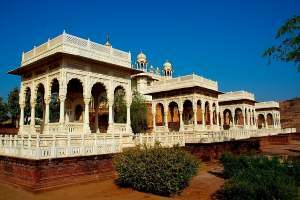 Like any other fort inside this Raj-mahal many items of old era are kept. In some floors roof was constructed by wood to keep them cool in hot summer climate of the desert. The kitchen items and war weapons of those days are kept inside. Gangore dresses of queens are in display here. The passages are intentionally made narrow for security proposes. Here each floor the view of the Jaisalmer town from the windows changes and the best view can be seen from top floor terrace. The state flag of the fort kept at this point and the view of the Jaisalmer town in golden color gives an excellent view. 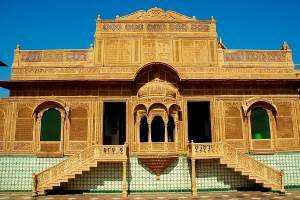 Like in any other towns of Rajasthan, Jaisalmer town has some beautiful Jain temples. There are seven Jain temples of 15th and 16th centuries inside the fort. 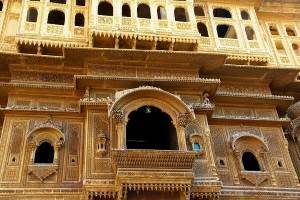 These temples build by using yellow sand stones perfectly matches with the beauty of the fort and the Jaisalmer town. 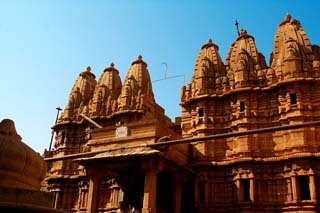 Beautifully stone carved arts are designed in these temples. Around the Jain temple inside the fort there are narrow passages with shops selling handicrafts and other tourist interested items, particularly to foreign tourists. Some shops were selling colorful turbans and traditional Rajasthan dresses. 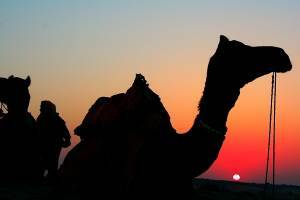 The puppets, colorful turbans and folk dances are now became the symbol of Rajasthan tourism. I need to buy Jaisalmeri multicolred turbans. Will appreciate if I could get contact information about a shop that sells Jaisalmeri turbans.